That's today's lunch, and last night's dinner, and yesterday’s lunch and it’s going to be tonight’s dinner too. Actually, as I type, the Crock-Pot is bubbling away in the kitchen; and I’m not afraid to say that I've made this recipe three times in the past...well...three days. 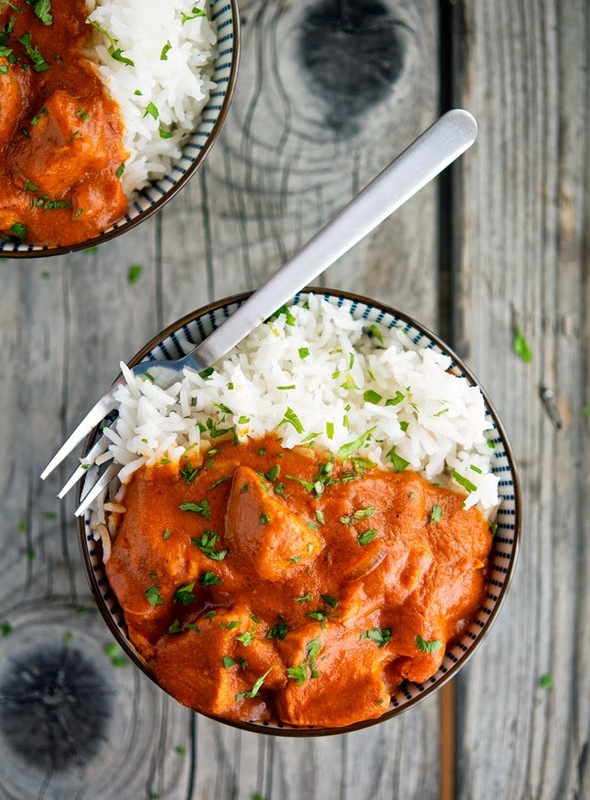 Which goes to show just how good this creamy coconut curry chicken is. Or maybe it shows that I’m an intrinsically obsessive person when it comes to food. When I find something I like, I keep making it (and eating it, of course) over and over. Luckily for me - most of the time - I don't have to worry about it. Because it’s mostly healthy food I’m obsessing over. Green protein smoothie, green juice, caramelized cauliflower and mushroom casserole, Thai-flavored honey glazed chicken, cauliflower crust garlic breadsticks and more recently zoodles. They have all been in my so-called food obsession list. Then there’s food I’ll never get tired of. Which is different from temporary obsessions. Such as guac, plain avocado, blueberries, sharp cheddar, a juicy T-bone steak on the BBQ with a baked potato, or sunny-side up eggs slathered with Sriracha. I could literally eat those foods every single day and never grow tired of them. Yum! I’d better stop. I’m getting hungry already and I just had breakfast. Back to this Creamy Coconut Curry Chicken. This one is a cinch. Actually, it is so easy, it’s embarrassing. Making the sauce takes 5 minutes, then you throw everything in the slow cooker and leave it to do the work. When it’s done B-O-O-M: a uber-creamy, slightly spicy, oh-so-addictive, melt-in-your-mouth coconut curry chicken. It’s pure comfort food, just lighter. It’s seriously good and perfect for quick weekday/weeknight/weekend - basically every day - meals. I love comfort food that is not really comfort food. I love food that so good I can't stop eating it. Easy Creamy Crock-Pot Coconut Curry Chicken Print this recipe! Heat coconut oil in a medium skillet over medium-high heat. Add onion and garlic and saute’ for 4 to 5 minutes, until translucent. Add garam masala, curry powder and chili powder and saute’ for 1 minute, until fragrant. Stir in coconut milk, tomato paste, salt, and pepper. Reduce the heat to low. In a small bowl combine cornstarch with 4 tablespoons of cold water, and gently stir into the coconut milk mixture. Turn off the heat. Grease the inside of your crockpot bowl with a bit of olive oil. Add chicken chunks, pour the sauce over it, and stir to coat. Cover and cook on low setting for 4 to 5 hours. One serving yields 357 calories, 14 grams of fat, 13 grams of carbs and 41 grams of protein. 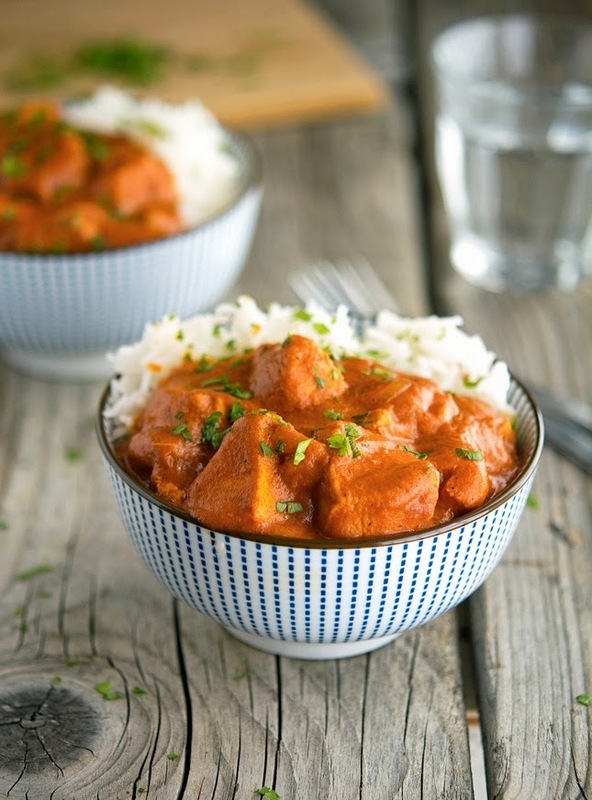 I do love me some chicken curry made with coconut milk! Mike - I have never used arrowroot powder in mine though - other than thickening it up - does it add a different taste? Fried egg covered in Sambal Oelek? Now you're talking my friend! About the arrowroot powder. It's just a thickening agent; which I feel is necessary because cooking in a crock pot usually generates quite a bit of liquid and there typically isn’t much thickening action. My oh my, looks delish! On a scale from 1 to 10, how hip is coconut sauce + chicken?? Jokes aside, this is getting better and better! Maybe we should merge our blogs Kari and create "TheIronGI365" or "TheGI365You" or "GIIron365" What do you think? You know, I must say we are very similar as far as food tastes go - your list of stuff you could eat every day gave me a huge smile, I would go for all of those without any problem, ok maybe the baked potato I could skip, but if you change that for sweet potato fries, I WILL fight for the last one with all my bravery. I am brave, only lose it around rodents. This looks super delicious!! So creamy! Love the new look, it very much suits your website Mike. The proper looking indian dish looks darn good too, and so simple, shukriya! Thank you so much Chantelle, it means a lot to me! 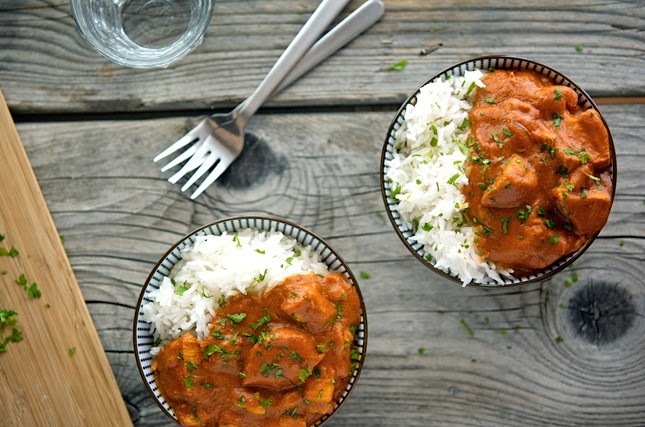 There is no dish that can compete with coconut chicken curry as far as comfort food goes. 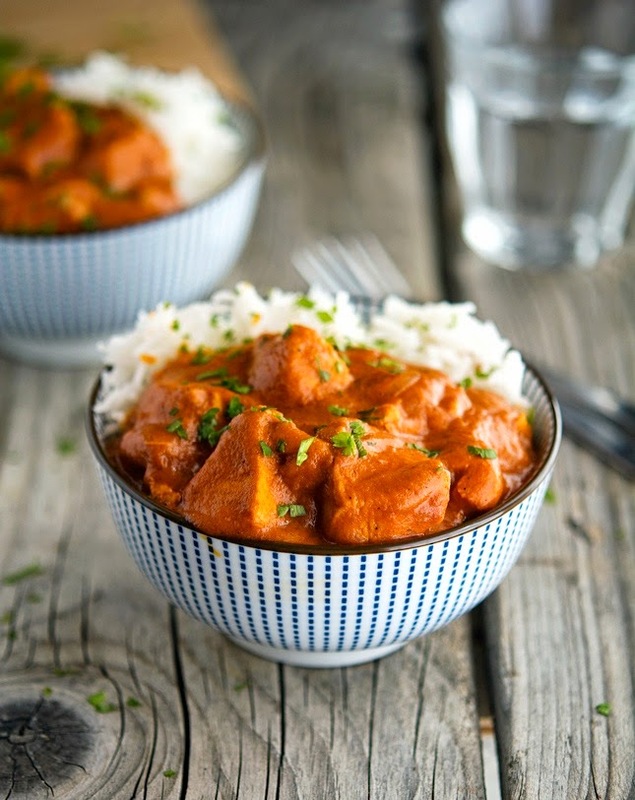 If I were to choose one dish and only one for the rest of my life, chicken curry would be my choice...! ... Although I would miss my guacamole... And sweet potato fries.. And steak... You know what, I'm pretty happy I don't have to choose! That aside, this truly looks beautiful, and I'm intrigued by the idea of doing it in the crock pot! I have to try that out. And the new layout is gorgeous, btw! I'm right there with you Line, picking one food to eat for the rest of your life is so hard. I don't think I could actually do it. I'm really glad you like the new layout, thanks! This is what I want to eat for dinner for the rest of my life. But seriously, we eat coconut curry like it's going out of style but I haven't made it in a crock pot! Pinned! The rain is finally pouring down in otherwise persistently dry and sunny California (so grateful) and this gorgeous comfort meal is going on today's menu. Thank you! me too. 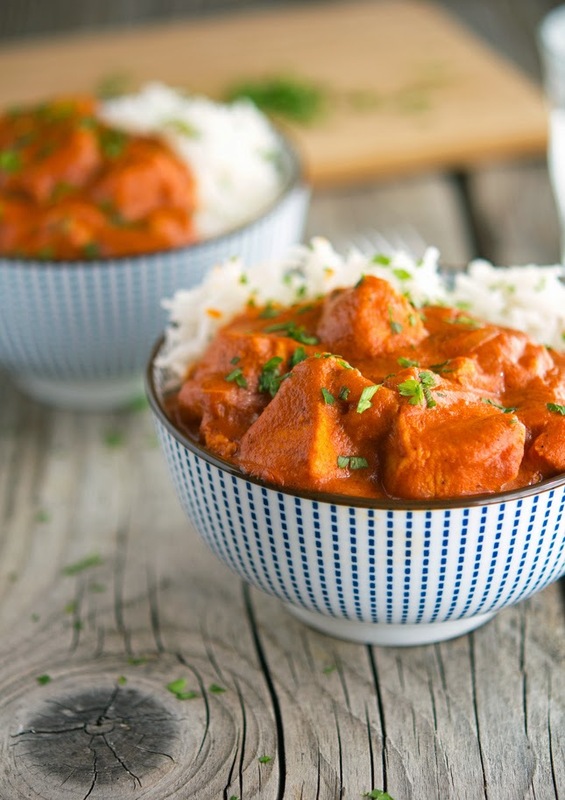 meanwhile, your chicken is in the crock-pot - the garam masala is so gorgeous in this recipe... I haven't had a bite yet but I'm already swooning - my kitchen smells divine from the skillet prep. Can't wait for dinner!! Hi Mike, this comfort food is superb, look so inviting and delicious. Very impressive photography skill and nice pictures. Thanks for sharing your recipe. Thank you Amelia, you're always super nice! Damn delicious and comforting curry!!! I love paleo crock pot meals! This one looks beautiful. Pinned! Simply delicious. I'm so going to prepare this! Awesome D, let me know if you like it! Help. Need Arrowroot powder and Garam Masala. I live in Houston, apparently we only speak McDonald's. Garam masala is available in most large grocery stores in the spice aisle. Whole Foods, Trader Joes...all carry garam masala. This looks amazing! Do I put the chicken chunks into the crockpot raw? Or do I cook them first? I am new to using a crockpot... :) Thank you! I would like to know that as well. Can you add veggies at some point? I'm looking for the same answer. Having made this recipe I would say: yes, you put the chicken in raw and yes, you can shove veggies in at any point, but it's easiest to put them in with the chicken. I am keen to try this recipe but don't have a crock pot, could this be cooked in the oven? I make this all the time and it always turns out perfect. I simmer the sauce for about an hour on the stove, and then add the raw chicken chunks and cook until they're done (for some reason, meat always ends up oevrcooked and tough in my slow cooker). 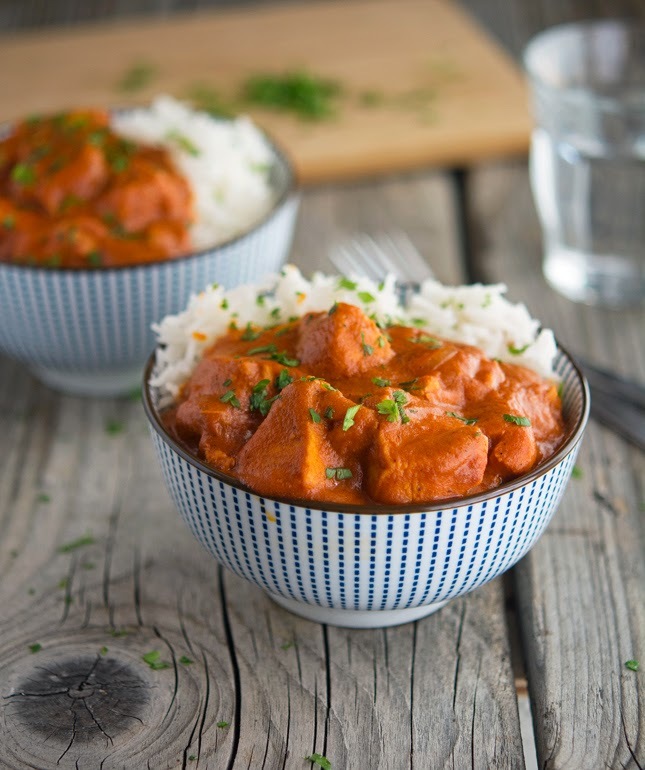 It's the perfect basic curry. Thanks for coming up with such a delicious and easy recipe! This was amazing, I made this last night: What a great tasting meal! Think I'll be cooking this one next week! Thanks for the inspiration! Could I add sweet potatoes to this and not have an issue? I'm making this for dinner tonight. Will report back with results! First off it was delicious! Very good flavor and the difference slow cooking it made to the tenderness of the chicken was very apparent. My sauce wasn't as thick but that could be because I substituted the arrowroot with about half of the amount of cornstarch. I cook a lot of Asian dishes and it can be difficult to find some of the more obscure ingredients, even at Asian grocery stores. BUT, for dry items like powders, pastes, spices, etc you can find almost anything on Amazon. Just made this for dinner last night and it is amazing! Simple, delicious, and now I have lunch and dinner for the next week hahah. Thank you! One of the best dishes I've ever made! I could eat this for every meal! I fried up some cauliflower "rice" and it was delish with this over it. Thank you for this recipe!!!! We made this for dinner last night and the whole family loved it! This is going on repeat for sure. Thanks for an easy and flavorful slow cooker recipe to keep in my back pocket! This is a fantastic recipe! I made a small change that really made it amazing though. I used 1/2 of the tomato paste in the recipe and replaced it with 2 heaping spoonfuls of natural peanut butter. Absolutely divine. OH MY WORD!!! This is one of me and my families' favorite recipes! All my 4 children between the ages of 2 and 7 LOVE it! Thank you! Just a note to any low-carb dieters out there, I do not add the arrowroot and I usually fry the chicken on the side and then add it to the sauce and we find that with the tomatoe paste, it's plenty thick enough! SO AMAZING!!!!! This looks so delicious BUT....here is the thing...I can't handle too spicy. Like I am milder than mild. My husband on the other hand likes hotter than Hades hot. How can I make this mild for me and then hand him the spices so he can add to his dish to get the heat that he so loves!! Where on the heat scale does this dish start at? Love this and have made it twice so far...it has made dinners so enjoyable during Whole30. 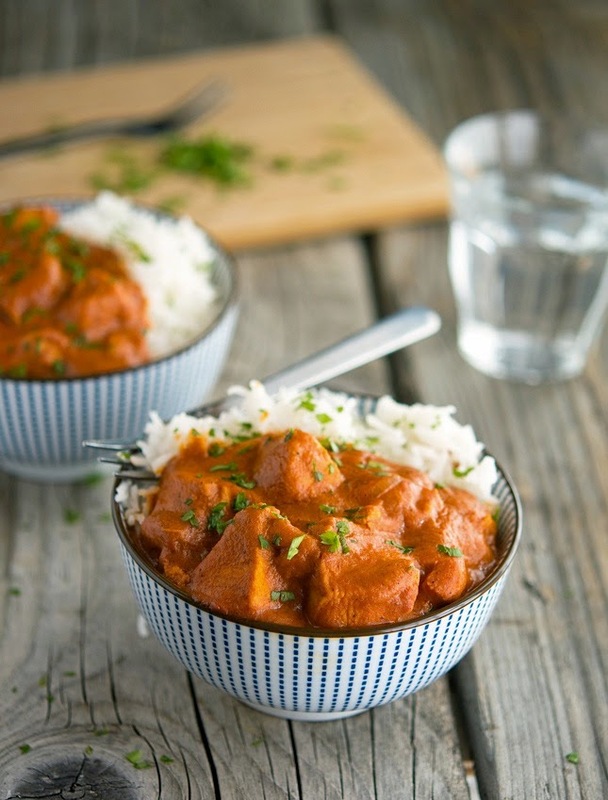 Trying your tikka recipe this week! Thanks for the yummy recipes! Should yellow Caribbean style, yellow Indian style or red curry be used? I am a novice cook and when I went shopping for ingredients I was surprised to find that there are various types of curry powder. HELP!!!! My slow cooker only sets in increments of 2 hours...so its either 4 or 6 hours. For those who have made this what do you suggest?? Is 4 hours enough time?? What makes this spicy? Can I remove it? We love this recipe! It's SO good. We made it last week for dinner and my only complaint is that I should have doubled it. We're making it again this week. Thanks!! That's awesome Camille, I'm so glad you guys enjoyed this recipe! I just made this tonight! My husband and I lovvvved it! I wasn't sure I'd like it because I think 'curry' is always spicy but this was delicious! Thank you! I'm going to try another soon. I've made this recipe several times before... and I don't recall ever adding my arrowroot powder to water before. Was I doing it wrong before or did the recipe change? Just made this for the first time. I threw in a bunch of baby carrots and some mushrooms to get my veggies in too. It is awesome, although for me I'll use a little less chili powder next time. Super good and easy. A friend made this for me and I asked for the recipe, so made this for the first time tonight! It's delicious. I was wondering if you've tried freezing a portion of it, and how that turned out once thawed and reheated?